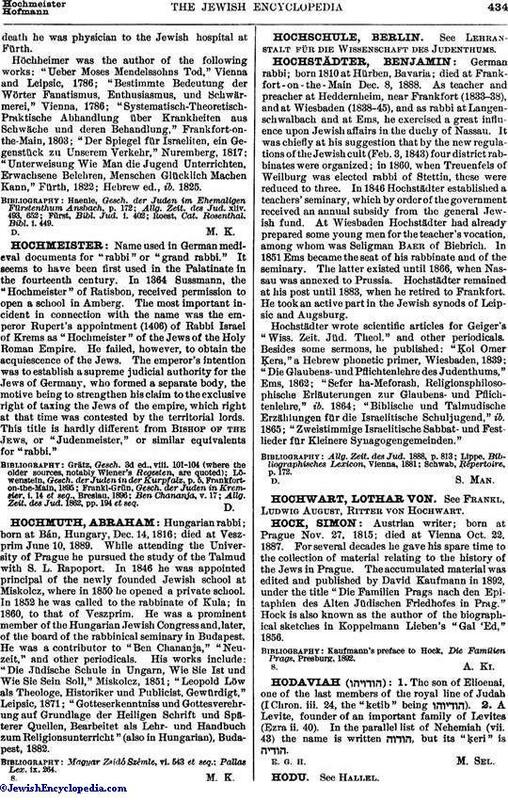 Name used in German medieval documents for "rabbi" or "grand rabbi." It seems to have been first used in the Palatinate in the fourteenth century. In 1364 Sussmann, the "Hochmeister" of Ratisbon, received permission to open a school in Amberg. The most important incident in connection with the name was the emperor Rupert's appointment (1406) of Rabbi Israel of Krems as "Hochmeister" of the Jews of the Holy Roman Empire. He failed, however, to obtain the acquiescence of the Jews. The emperor's intention was to establish a supreme judicial authority for the Jews of Germany, who formed a separate body, the motive being to strengthen his claim to the exclusive right of taxing the Jews of the empire, which right at that time was contested by the 'territorial lords. This title is hardly different from Bishop of the Jews, or "Judenmeister," or similar equivalents for "rabbi." Allg. Zeit. des Jud. 1862, pp. 194 et seq.